This map was published in 1910, but must have been surveyed a few years earlier. There are a few houses around, including the ones in the background of the view. By the 1930s most of the lane was lined with houses, most of them individually designed. The orange spot on the map marks 271 and 273. Handley Road (named after Diana Handley, who married William Davenport of Bramall Hall) is in process of development. By 1939 the name 'Bramhall Lane South' had come into use. By 1963 the present layout along Bramhall Lane South was complete, and the estate in the North Park Road area was under construction, seen in the top left corner of the extract. 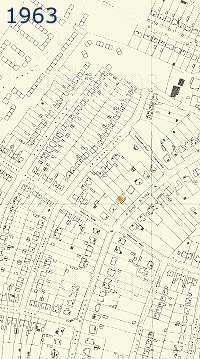 A curiosity is that a short street called Humphrey Road existed at that time, north-east of Handley Road. Was it named after Salusbury Pryce Humphreys, the father of William Davenport? It has since disappeared from the scene. 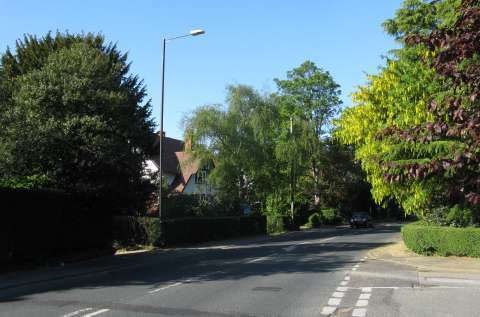 The area remains highly desirable as a place to live, even though the houses are not far from the busy road. No. 273 changed hands in 2010 for almost £400,000. Special thanks to the current owners of No. 271 for their interest and contribution. This card, originally posted in 1913, had us baffled until we took a walk on Bramhall Lane, and kept walking towards Bramhall over the railway bridge to the junction of Handley Road. The view looks back from there towards Stockport. 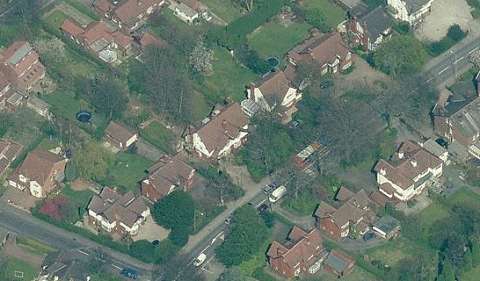 The pair of semi-detached houses in the centre with the white gables in the centre are now 271 and 273 Bramhall Lane South. 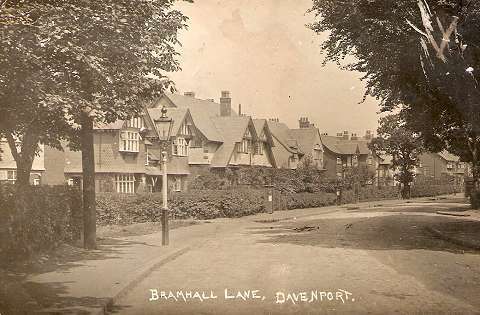 All the houses in this scene were quite new at the time of the picture; it appears that the area between the railway bridge and Bramhall Park Road was considered part of Davenport at that time (possibly still is by some), and this section of road was called simply 'Bramhall Lane' rather than 'Bramhall lane South' as at present. The view is hard to replicate exactly today, except perhaps in winter, due to the growth of trees and the danger of standing in the middle of the road; this is the best we could do. The gables of 271 and 273 locate the scene, which apart from the trees has changed very little apart from the road surface and the lamps. The modern view from the air (from Bing maps). Note that the garden of 271 still runs all the way back to Abingdon Road, although most others have had houses built there. This area, south of the Midland Railway bridge, was part of Hazel Grove and Bramhall Urban District at the time the houses were built, and remained so until 1974. When house numbers were allocated, on is now known as Bramhall Lane South they started from Bramhall village and numbered towards Stockport, with odd numbers on the left, north-west, side. The Stockport section numbers start from 1 at the junction with the Manchester - Buxton road, and number towards Bramhall, with the odd numbers on the left, i.e. south-east. The two numbering systems run to over 300, causing a confusing situation either side of the railway bridge, although since there are signs on the bridge parapet giving the change of road name they can easily be missed. Checking all these in the Land Registry would be expensive, so we will take No. 271, in the centre of the picture, as an example. 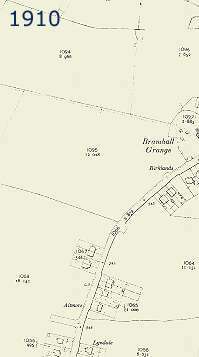 Land Registry records indicate that the plot on which the semi-detached houses 271 and 273 stand was sold by the Freeholders Company (which had purchased the Bramhall Hall estates) in February 1910 to Martha Emily Hazeldine. She was the wife of Samuel Hazeldine, a 'joiner and builder' of 67 Station Road, Cheadle Hulme, who then built the pair of houses; perhaps 271 was initially rented by Mrs Jepson. There is reference to a 'Conveyance dated 15 September 1913 made between (1) Martha Emily Hazeldine and (2) Mary Frances Gertrude Jepson' from which we can deduce that No. 271 was in fact "Woollahra" - named for a town in New South Wales, Australia. The 1911 census tells us that Mrs Mary Jepson, born about 1870 in Australia, was a widow by the time she moved to No. 271, a five-bedroom house, where she was living in 1911 with her sons Sidney (21), Stanley (18), Harold (15), Bernard (13) and Gordon (11), all born in Stockport, and her daughter Mabel, aged 8. Mary's mother, Ann Brooks, was born in Stockport around 1830, and lived in Australia for some years, before returning with six children, all born in Australia, to Stockport shortly after Mary, the youngest, was born. Mary's husband Thomas Pearson Jepson (born c. 1863) had worked for Stockport Corporation as a clerk. 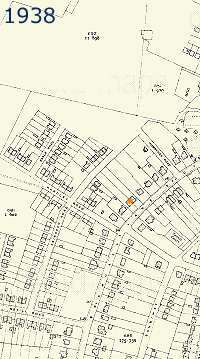 When first married in 1889 they lived with her mother at 15 Dale Street, Edgeley, and by 1901 they had their own home was 44 Sutton Road, Heaton Norris, but apparently they moved to the Saltash area of Cornwall shortly after that, as their daughter Mabel was born there, and Thomas died there in 1910 aged only 47. Mrs Jepson clearly decided to return to the Stockport area, and moved the family into a new modern house which she named after the town of her birth in Australia, even though she had left there as a baby. At least two of her sons Sidney and Stanley enlisted in the Army during World War I and were officers in the North Staffordshire Regiment; Stanley died in Lille, France in 1919, a victim of the great Influenza epedemic. He is chronicled on the Stockport 1914-1918 website. Harold and Bernard are also believed to have served in the War. The house remained with the Jepson family for many years, retaining all its original features: Mary in died in 1962, aged 95, and the house passed to her un-married daughter Mabel who lived there until she sold it in 1986 to a family who still live there happily in 2011. A remarkable continuity of ownership, although perhaps quite typical of our area.